Please refer to our stock # TC100021 when inquiring. From Germany in the 1930s. 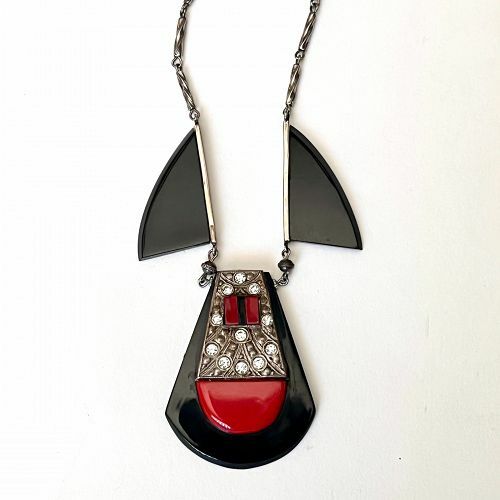 A beautiful Jakob Bengel machine-age piece in true ART DECO style made of black and red galalith with chrome and rhinestone details.The pictures do not do justice to this magnificent item.This is a fantastic period style piece, a truely unique item. The necklace is 18 inches long with a strong clasp, and the middle design in the front is 4 inches wide. The two side geometric side pieces are each is 1 1/4 inc by 3/4 inch. The large red and black "jeweled" piece is 1 3/8 inches by 1 1/4 inches. The necklace is in excellent condition with no problems. Don´t miss this really rare opportunity to own an important piece of costume jewelry history! !